BLOOMINGTON – For somebody who just won a medal at the IHSAA boys state track finals, Luke Griner wasn’t a real happy fellow. “I’m upset with my time. 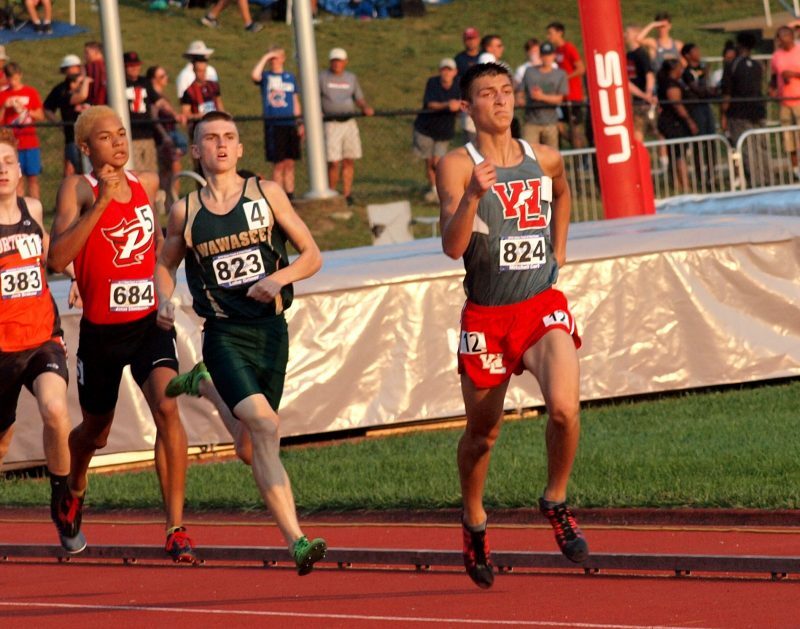 I ran faster at the (Warsaw) regional last week,” said the Wawasee junior following his eighth-place finish in the 800-meter run Saturday at the Indiana University track in Bloomington. In a close, tactical race, Griner made a gutsy move to assume the lead after one lap, fought gamely down the backstretch, then faded a bit on the final dash to the finish line. Keith Abramson of Avon, who ran in a “slow” heat of the race, finished first in 1:54.62. Griner clocked 1:56.28, edging Culver Academies senior Callaway Bird by four-1,000ths of a second for eighth place. In a meet marked by state records and incredibly close races, Griner was the only local athlete to bring home an IHSAA award medal. Plymouth senior Nate Patterson shattered the previous state record when he cleared 7 feet, 4 inches in the high jump, then made three close attempts at a national record of 7-6 ¼.
Plymouth’s Nate Patterson celebrates after setting a state record in the high jump. Patterson claimed his second state championship in the high jump, but failed to pull out a win in the long jump. There, the USC recruit finished seventh by leaping 22 feet, 9 inches. Warsaw had a quiet state meet, with no Tigers coming close to winning a medal. 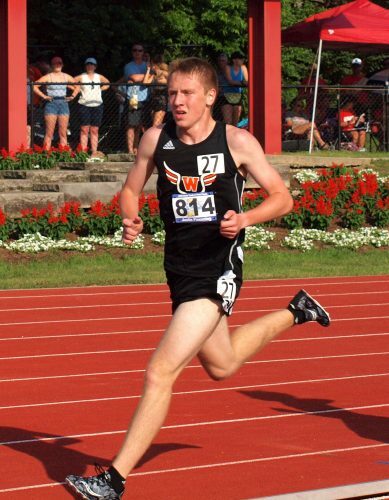 Senior Justin Fleming had one of the better Tiger finishes, clocking 4:23.27 to place 19th in the 1600-meter run. Warsaw’s 4 x 800 relay squad of junior Nolan Groninger, seniors Xavi Ramirez and Taylor Mills and freshman Tanner Stiver finished 25th, clocking 8:19.90. Pole vaulter Hunter Metzger, a junior, cleared 12 feet, 6 inches and could go no further, finishing 21st out of 27 competitors. A new state record was set in that event as well. Frankfort’s Colton Crum cleared 17-6 ¼ to establish a new state best. Tippecanoe Valley senior Jameson Baker came close – really close – to scoring in the shot put, as he reached 53 feet, 11-1/4 inched. He finished 11th. Only the top nine finishers in each event earn a medal. Senior Dakota Parker, also from Tippecanoe Valley, clocked 51.13 to finish 23rd in the 400-meter dash. In that same race, South Bend Adams’ Milton Toliver pulled a muscle about 100 meters after the start. He waved off the athletic trainers after a minute, got up, and slowly limped around the track to finish his race. NorthWood senior Terrell Pratcher finished 19th in the 200 in a time of 22.50. While he was glad to win a state medal for the second year in a row, Griner said he was leaving the spring season with regrets that he didn’t run a better race. Avon beat Indianapolis North Central, 66-47, to claim the boys team title. TEAM SCORES: Avon 66, Indpls North Central 47, Hamilton Southeastern 44, FW Northrop 36, Pike 36, Zionsville 31 , FW Carroll 31, Carmel 26, Evansville Memorial 18, Fishers 16, Chesterton 16, Westview14, Pendleton Heights 14, West Lafayette 14, Plymouth 13, Michigan City 12, Crown Point 12, Merrillville 12, Brownsburg 11, Indianapolis Cathedral 11, Lawrence North 11, Western 10, Frankfort 10, Christian Academy Of Indiana 10, West Vigo 9, Oak Hill 9, Lowell 9, Valparaiso 8, Center Grove 8, Anderson 8, FW Snider 8, Ben Davis 7, Silver Creek 7, FW Wayne 7, Mitchell 6, FW South 6, Warren Central 6, Indpls Ritter 6, Franklin Central 6, Andrean 5, SB Saint Joseph 5, Decatur Central 5, Evansville Mater Dei 5, Northwestern 5, Cascade 5, Portage 5, Norwell 5, Bloomington South 5, Bethany Christian 5, Brownstown Central 4, Brown County 4, DeKalb 4, LaPorte 4, Evansville Central 4, McCutcheon 3, Princeton 3, Northridge 3, Western Boone 3, Highland 3, Churubusco 3, Concord 2, Leo 2, Westfield 2, Eastbrook 2, Wawasee 2, Seymour 2, Terre Haute South 1, Heritage Hills 1, New Albany 1, Culver Academies 1. 4 x 800 Relay: 1, Indianapolis North Central (Ian Hunter, Jonathan Loureiro-Deem, Jacob Lough, Isaac Weber) 7:44.07. 2, Zionsville 7:48.36. 3, FW Northrop 7:48.46. 4, Westview 7:49.08. 5, Carmel 7:49.20. 6, Brown County 7:49.43. 7, Indianapolis Cathedral 7:50.48. 8, Leo 7:51.49. 9, Fishers 7:52.40. … 17 SB Saint Joseph (Gideon Lawson, Joe Deahl, Bill Powers, Amani Morrell) 8:02.62 … 22, Elkhart Central (Jacob Kaiser, Adam Delks, Elias Soto, Luis Perez) 8:04.84 … 25, Warsaw (Nolan Groninger, Xavi Ramirez, Taylor Mills, Tanner Stiver) 8:19.90. 110 high hurdles: 1, Madison Norris (Hamilton SE) 14.02. 2, Jaien Webster (Anderson) 14.13. 3, Tremaine Gonzalez (Silver Creek) 14.19. 4, Shaton Vaughn (FW Northrop) 14.29. 5, Daryl Black (Pike) 14.31. 6, Cameron Williams (Andrean) 14.32. 7, Chase Washington (Bloomington South) 14.48. 8, -Malachi Quarles (Franklin Central) 14.67. DQ: Stacen Cunningham (Evansville Memorial). … TRIALS: 15, Harold Moon (Concord) 14.96 … 25, Sam Tanner (Plymouth) 15.38. 100: 1, Isaac Guerendo (Avon) 10.51. 2, Justin Becker (FW Carroll) 10.52. 3, Craig Young (FW Wayne) 10.58. 4, Noah Malone (Hamilton SE) 10.70. 5, Blayne Harrington (Decatur Central) 10.75. 6, Ethan Roach (West Vigo) 10.76. 7, Kyle Markland 10.85. 8, Jalen Bowman (Evansville Central) 10.98. 9, Tyler Thomas (Andrean) 11.01. … TRIALS: DQ: Jakale Conerly (Concord). 1,600: 1, Matthew Schadler (Evansville Memorial) 4:07.83. 2, Cole Hocker (Cathedral) 4:08.04. 3, Jesse Hamlin (FW Snider) 4:12.14. 4, Gabe Fendel (Hamilton SE) 4:14.07. 5, Connor Goetz (FW Carroll) 4:14.28. 6, Richmond Stoltsfus (Westview) 4:15.07. 7, Justin Niederhaus (Princeton) 4:15.29. 8, Connor White (Eastbrook) 4:15.90. 9, Jacob Wisniewski (Bloomington South) 4:16.54. … 19, Justin Fleming (Warsaw) 4:23.27 … 26, Nathan Dibley (Elkhart Central) 4:37.90. 4 x 100 Relay: 1, Avon (Geordan Blades, Christopher Smith, Jaban Carter, Isaac Guerendo) 41.28. 2, Hamilton Southeastern 41.59. 3, Pike 41.97. 4, Warren Central 42.12. 5, Fishers 42.18. 6, Portage 42.23. 7, Brownsburg 42.28. 8, Concord (Jamyris Rice, Conerley Jakale, William Hayes, Caleb Smith) 42.55. 9, FW Snider 42.60. … 13, Elkhart Central (Dominic Davis, Adam Moon, Desmond Johnson, Bernard Gilbert) 42.89 … 20, Goshen (Tyler Brinson, Daveyon Sandford, Brandon Holley, Domonick Swinney) 43.94. 400: 1, Braden Corzan (Chesterton) 47.41. 2, Tahj Johnson (Oak Hill) 48.42. 3, Spencer Gudgel (Carmel) 48.53. 4, Brett Otterbacher (Valparaiso) 48.91. 5, Sean Johnson (Cascade) 48.91. 6, Matt Fleener (Center Grove) 48.92. 7, Dylan Penn (Evansville Memorial) 49.08. 8, Matthew Hanlon (Crown Point). 9, Bryce Kirtz (Brownsburg) 49.18. … 12, Harold Moon (Concord) 49.53 … 23, Dakota Parker (Tippecanoe Valley) 51.13 … 26. Milton Toliver (SB Adams) 2:50.61 (injured). 300 hurdles: 1, Shaton Vaughn (FW Northrop) 37.52. 2, Benjamin Marano (FW Carroll) 38.27. 3, Matt Sakeah (Pendleton Heights) 38.32. 4, Nathan Smith (Hamilton SE) 38.39. 5, Dylan Felger (Norwell) 38.59. 6, Ernest Weni (Pike) 38.96. 7, Cole Maguire (North Central) 38.98. 8, Xavier Griffin (Merrillville) 38.99. 9, Sam Hohlt (Center Grove) 39.02. … 11, Deshawn Grace (SB Washington) 39.20 … 23, Ryan Steder (LaPorte) 40.30 … 25, Sam Tanner (Plymouth) 40.59. 800: 1, Keith Abramson (Avon) 1:54.62. 2, Jacob Lough (Indianapolis North Central) 1:54.91. 3, Yonas Araya (Ben Davis) 1:55.05. 4, Jalen Royal (FW Northrop) 1:55.41. 5, Matthew Schadler (Evansville Memorial) 1:56.05. 6, Mitch Curl (West Lafayette) 1:56.07. 7, Tanner Sallee (Northridge) 1:56.27. 8, Luke Griner (Wawasee) 1:56.28. 8, Callaway Bird (Culver Academies) 1:56.28. 9, Adam Gasaway (LaPorte) 1:56.30. 200: 1, Justin Becker (FW Carroll) 21.50. 2, Isaac Guerendo (Avon) 21.57. 3, Jahn Riley (Pike) 21.67. 4, Noah Malone (Hamilton SE) 21.71. 5, Ethan Roach (West Vigo) 21.96. 6, Keyshawn McGill (Michigan City) 21.99. 7, Isiah Baxter (Carmel) 21.99. 8. Jalen Bowman (Evansville Central) 22.11. 9. Kyle Markland (Franklin Central) 22.21. … TRIALS: 17, Adam Moon (Elkhart Central) 22.37 … 19, Terrell Pratcher (NorthWood) 22.50 … 26, Sam Schlimpert (New Prairie) 23.02. 3,200: 1, Skylar Stidam (Christian Academy) 9:13.34. 2, Alec Fleming (Lowell) 9:13.92. 3, Ben Miller (Carmel) 9:14.90. 4, Ian Hunter (Indianapolis North Central) 9:15.58. 5, Amani Morrell (SB Saint Joseph) 9:15.68. 6, Matthew Yoder (Westview) 9:16.79; 7, Will Persin (McCutcheon) 9:17.24. 8, Collin Huber (Valparaiso) 9:18.21; 9, Noah Hufnagel (Heritage Hills) 9:18.93. … 25, Nathan Dibley (Elkhart Central) 10:11.92. 4 x 400 Relay: 1, Fishers (Nicholas Carrithers, Henry Lewis II, DiSean Graham, Benjamin Norton) 3:15.80. 2, Indpls North Central 3:16.43. 3, FW Northrop 3:18.45. 4, FW South 3:18.77. 5, Pike 3:19.36. 6, Carmel 3:19.53. 7, Center Grove 3:19.76. 8, Hamilton Southeastern 3:20.00. 9, Lowell 3:20.11. … 21, Elkhart Central (Jacob Holt, Spencer Stalker, Naieem Bean, Kyran Pearson) 3:24.21 … 23, SB Saint Joseph (John Driscoll, Gideon Lawson, Patrick Driscoll, Jacob Moon) 3:26.58 … 25, Goshen (Marlon Garcia, Brandon Holley, Daveyon Sandford, Domonick Swinney) 3:27.01. Discus: 1, Tyler Gilbert (Western) 177-3. 2, Ethan Alyea (North Central) 176-9. 3, Grayson Zinn (Zionsville) 171-4. 4, Brock King (Avon) 169-0. 5, Michael Boots (Evansville Mater Dei) 166-8. 6, Bennett Clark, Bennett (Zionsville) 166-3. 7, Gannon Grider (Highland) 164-6. 8, Brett Norton (Merrillville) 163-1. 9, Jonathan Dodrill (Bloomington South) 162-11. … 10, Justin Wozniak (Michigan City) 162-5. High Jump: 1, Nate Patterson (Plymouth) 7-4 (STATE RECORD). 2, Lawrence Mitchell (Pike) 6-10. 3, Eli Pancol (Pendleton Heights) 6-8. 4, Matthew Jenkins (Mitchell) 6-7. 5, Simon Miller (Bethany Christian) J6-7. 6, Isaas Brown (DeKalb) J6-7. 7, Logan Benson (Western Boone) 6-6. 8, Keyshawn McGill (Michigan City) J6-06. 9, Nd Eze (New Albany) J6-6. … (tie) 10, Shane Glasco (Mishawaka) 6-4 … (tie) 14, Kevin Krutsch (Penn) 6-4. (tie) … 28, Jacob Marsh (LaPorte) 6-2. Pole Vault: 1, Colton Crum (Frankfort) 17-6 ¼ (STATE RECORD). 2, Nathan Stone (Lawrence North) 17-0. 3, Dillon Richard (Avon) 15-6. 4, Ben Raffin (Chesterton) 15-0. 5, Lucas Bender (Zionsville) 15-0. 6, Colton Ritz (Brownstown Central) 14-9. 7, Sam Wood (Churubusco) J14-9. 8, Payton Haack (Westfield) 14-6. 9, Jacob Bondon (Portage) 14-6. … (tie) 16, Lucas De Moya (Goshen) 14-0 … 21, Hunter Metzger (Warsaw) 12-6 … 22, Dominic Nipper (Penn) 12-6. 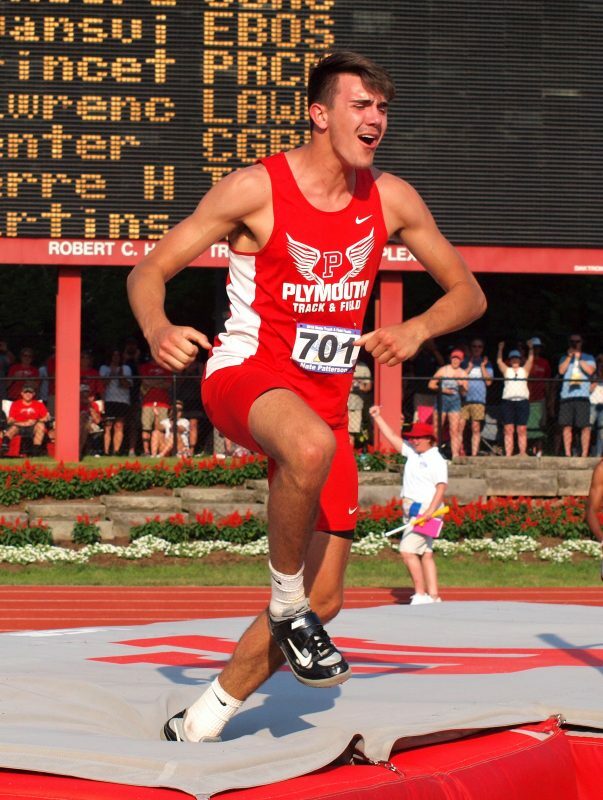 Long Jump: 1, Nick Ryan (Crown Point) 23-5 ½. 2, Isaac Guerendo (Avon) 23-3 ½. 3, Pierce Thomas (Brownsburg) 23-2 ¼. 4, Kynton Grays (Indianapolis Ritter) 22-10 ¾. 5, Tayson Parker (Northwestern) 22-09 ¾. 6, Tyler Bensz (LaPorte) 22-9 ¼. 7, Nate Patterson (Plymouth) 22-9. 8, Lance Roark (Seymour) 22-8 ¾. 9, Sanmy Sommers (Oak Hill) 22-7 ½. … 12, Luke Beehler (LaVille) 22-3 ¼ … 13, Keyshawn McGill (Michigan City) 22-3. Shot Put: 1, George Karlaftis (West Lafayette) 60-0 ½. 2, Brett Norton (Merrillville) 59-7 ¼. 3, Grayson Zinn (Zionsville) 59-6 ¼. 4, Ryan Stefanko (Michigan City) 59-3 ½. 5, Brock King (Avon) 57-6 ¾. 6, Ethan Alyea (North Central) 56-11 ¾. 7, Tyler Majors (Lawrence North) 56-11. 8, Nathaniel James (Avon) 56-2 ¾. 9. Jason Swarens (TH South) 55-11 ¾. … 11, Jameson Baker (Tippecanoe Valley) 53-11 ¼ ,, 12, Brock Tauteris (Goshen) 53-11. MENTAL ATTITUDE AWARD: Colton Crum (Frankfort). 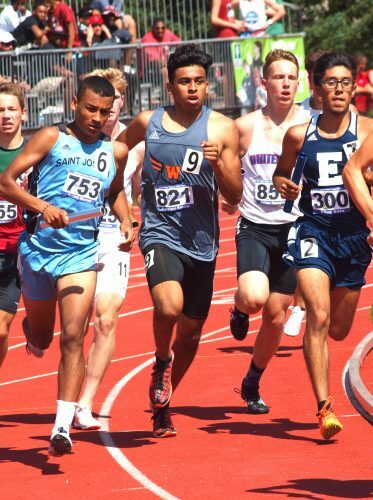 Xavi Ramirez (center) works his way though traffic during the 4 X 800 relay event. Justin Fleming competes in the 1,600 for Warsaw.